We describe 13 polymorphic microsatellite loci for the okapi (Okapia johnstoni). These markers were tested with 20 samples collected from a number of populations and exhibited a mean of 6.1 alleles per locus and a mean expected heterozygosity of 0.759. All but one locus was in Hardy–Weinberg equilibrium, and no evidence for linkage disequilibrium was detected between any loci. These loci will be useful for the future study of population genetic diversity and genetic structure in this elusive and emblematic species. 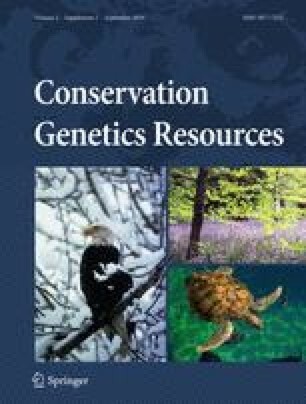 The authors are grateful to Carolyn Sanguinetti and Brookfield Zoo for assistance with sample collection and processing and to Gilman International Conservation, for partial funding for this study. We would like to thank everyone in C5.15 for assistance in the lab. We would also like to thank The Damned for inspiring the project. Nibbled to death by an okapi, nibbled to death by an okapi.